when we put those two words together, ‘cycling’ and ‘cancer’, one thing, one name, immediately pops up in our heads: Lance Armstrong. google pro cyclists cancer and you’ll be met by page after page of news on LA and the Livestrong foundation and on his battle against testicular cancer, which, fortunately of course, he won. but is there a deadlier connection between cycling and the disease that is characterised by unregulated cell growth and that proves so devastating for so many? quite what ‘not just that’ means is unknown, but of interest here is that link he makes to doping and his illness. he’s not the first rider to make that link either. 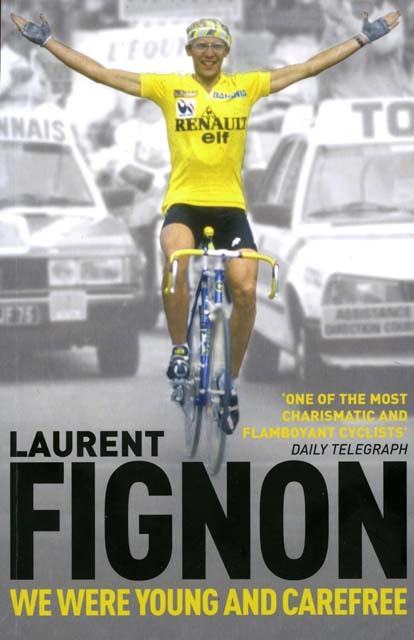 far more successful than Gasparre, Frenchman Laurent Fignon, winner of one Giro d’Italia and two Tour de France, also connected his own personal history of abusing banned substances with the cancer that eventually killed him. Fignon retired in 1993, after, according to him, deciding not to take EPO. disgruntled that ‘lesser’ riders were suddenly keeping up with him, he left the peloton to forge a fairly successful career as a television pundit, commenting on pro racing and garnering a new generation of fans. in the commentary box he displayed an intelligence and knowledge that was highly valued but also a hitherto unexposed sense of humor, one that he hid well when a pro, famous as he was for his outbursts and short temper. yet Fignon did admit to doping – though he stated it was more ‘recreational’ than systematic, noting that the cocaine was a popular drug of the 80s era – and wondered, as cancer slowly overwhelmed him, if the cause was that abuse. 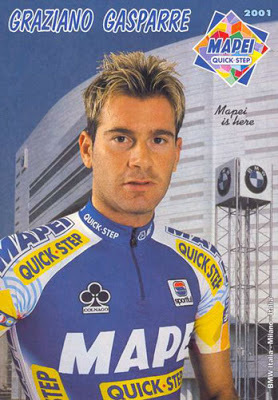 it gives me no pleasure to note that Gasparre’s amateur career began around ’98, and that he first turned pro in 2001, when EPO and the use of Human Growth Hormone was rampant. it’s not necessary for me to dwell too long on the case of Armstrong, which you will all be familiar with. LA’s cancer was diagnosed in 1996, 4 years after making his debut in the pro peloton, and testimony from Betsy Andreu, who was in LA’s hospital room at the time, states that when asked by a doctor to list all the drugs he was on, Armstrong reeled off a list of several banned substances, including HGH, steroids and EPO. for the record, i am not saying categorically that Armstrong’s or Fignon’s cancer were caused by doping. in Fignon’s case, if it’s true that he didn’t take EPO, the link is, in any case, more tenuous (though if he took HGH or steroids, it becomes, on the evidence or scientific studies, stronger). Armstrong was on the lot however, as was Gasparre. if we look at the scientific research on the link between doping with these substances and cancer we see a much more firm connection taking shape. Pre-clinical studies and epidemiological observations in patients with an excess of hormone production or in patients chronically treated with hormones/growth factors for various pathologies have warned about the potential risk of cancer development and progression which may be also associated to the use of certain doping agents. Anabolic steroids have been described to provoke liver tumours; growth hormone or high levels of its mediator insulin-like growth factor-1 (IGF-1) have been associated with colon, breast, and prostate cancers. Actually, IGF-1 promotes cell cycle progression and inhibits apoptosis either by triggering other growth factors or by interacting with pathways which have an established role in carcinogenesis and cancer promotion. More recently, the finding that erythropoietin (Epo) may promote angiogenesis and inhibit apoptosis or modulate chemo- or radiosensitivity in cancer cells expressing the Epo receptor, raised the concern that the use of recombinant Epo to increase tissue oxygenation might favour tumour survival and aggressiveness. Cancer risk associated to doping might be higher than that of patients using hormones/growth factors as replacement therapy, since enormous doses are taken by the athletes often for a long period of time. Moreover, these substances are often used in combination with other licit or illicit drugs and this renders almost unpredictable all the possible adverse effects including cancer. Anyway, athletes should be made aware that long-term treatment with doping agents might increase the risk of developing cancer. 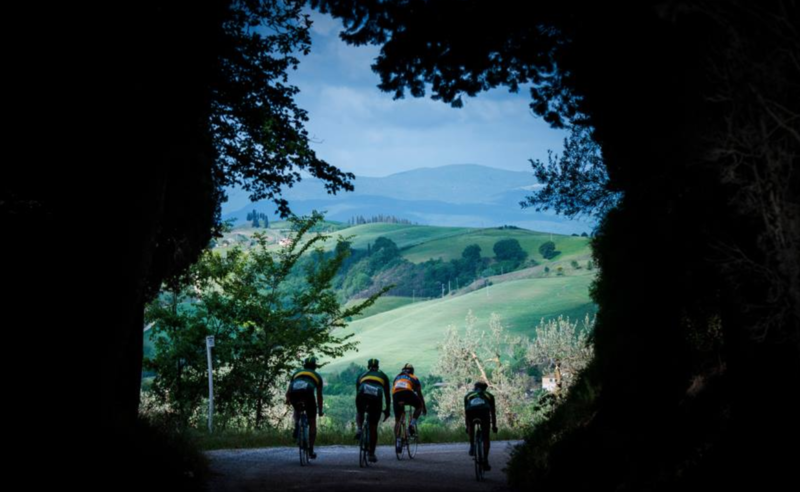 did doping cause the cancers of Fignon, Armstrong and Gasparre? i do not know. could it have? on the evidence gathered in several scientific studies and presented here, the answer is yes. hi there, thanks for the comment, much appreciated! shame i am getting well known for doping! haha, the irony! but seriously, thanks, kind words… keep on cranking! I had very little sympathy for Lance Armstrong when I first had the uncomfortable feeling that he must have been doping to win some if not all of his tours. That evaporated when he finally chose to confess on Oprah Winfrey instead of holding a press conference or giving an interview to a cycling magazine or newspaper that could at least have asked him some more probing questions. It’s only since reading your article that the penny dropped, and now I realise it was his doping that almost certainly caused his cancer in the first place. Having read Tyler Hamilton’s book The Secret Race, I’ve come to realise that Lance was not only a cheat he was a bully and would use every tool at his disposal to make the lives of his enemies miserable. I find myself in agreement with Paul Kimmage when he describes Lance as the “cancer” in the cycling community. This video of them clashing at a press conference http://www.youtube.com/watch?v=nZgns7CXeUI makes my hair stand on end, it shows his willingness to openly insult those who knew the truth about him. Awesome! Its actually awesome post, I have got much clear idea concerning from this article. Distinct merchants might supply varying bargains all-the-time.